Atlanta's favorite feline-themed artist extraordinaire, Catlanta (AKA Rory Hawkins), visited the teens group at Kate's Club to talk about gratitude and create these awesome journals! Kate's Club offers a safe space to face grief for young people who have experienced the loss of a parent of sibling. 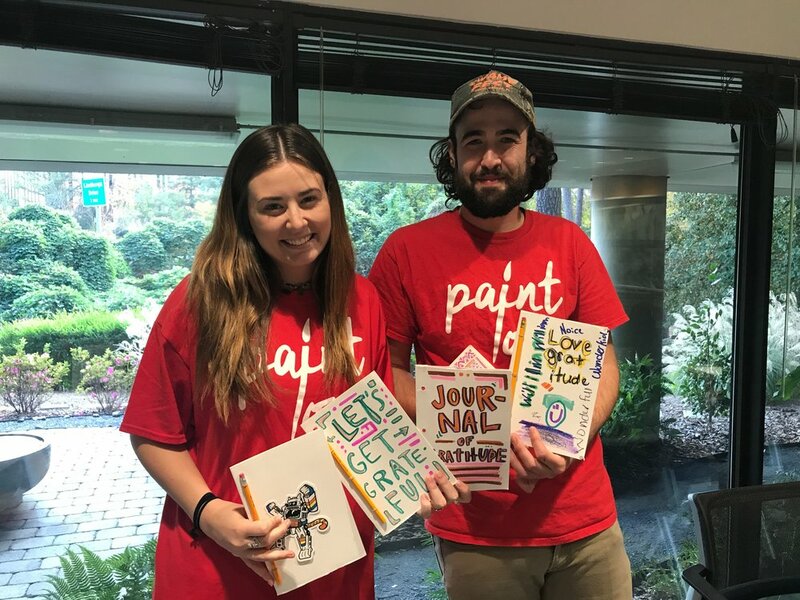 Creating unique, personalized journals just for capturing our gratitude is a favorite activity here at Paint Love. It's been proven that keeping a gratitude journal and writing for just a few minutes during the day or simply jotting down a couple bullet points about things that made you feel happy or thankful before you go to bed at night, can dramatically change the way you engage the people and world around you. Gratitude journals help lower stress levels, and help establish habits seeking the good in every day. Go for depth over breadth. Elaborating in detail about a particular person or thing for which you’re grateful carries more benefits than a superficial list of many things. Try subtraction, not just addition. Consider what your life would be like without certain people or things, rather than just tallying up all the good stuff. Be grateful for the negative outcomes you avoided, escaped, prevented, or turned into something positive—try not to take that good fortune for granted. See good things as “gifts.” Thinking of the good things in your life as gifts guards against taking them for granted. Try to relish and savor the gifts you’ve received. Revise if you repeat. Writing about some of the same people and things is OK, but zero in on a different aspect in detail. Don’t overdo it. Evidence suggests writing occasionally (1-3 times per week) is more beneficial than daily journaling. That might be because we adapt to positive events and can soon become numb to them—that’s why it helps to savor surprises.